We are grateful to animation historian Ray Pointer for making this rare, very early film available! Created in 1919, this is one of Max Fleischer's earliest surviving works. At the time, Max and his brother Dave were still creating work in their own living rooms. Max did all the drawings, with his brother Dave's antics forming the basis of the film's clown character, a clown the world would soon as Koko. It's interesting to note that the running time for this film is not quite 3 minutes - half the time of standard animated films that usually ran 6-7 minutes. Working without a staff, creating even a short piece of animated film was a tremendous amount of work. 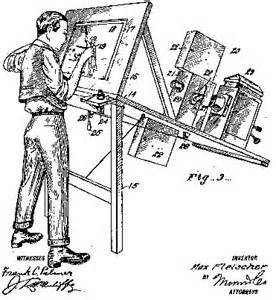 Max used these early films to showcase his invention, the rotoscope. The movement in early animated films tended to be extremely jerky; the rotoscope enabled animators to create characters with smoother, more life-like movement. The importance of film preservation is vital to the survival of Max Fleischer's work. Only half his work for Bray is known to survive, including only 10 of the 20 Out of the Inkwell films. The earliest and the rarest is The Clown's Pup. It has survived through several generations of duping on cheap Home Movie releases. Here is the best I can do with it until a better print source surfaces.